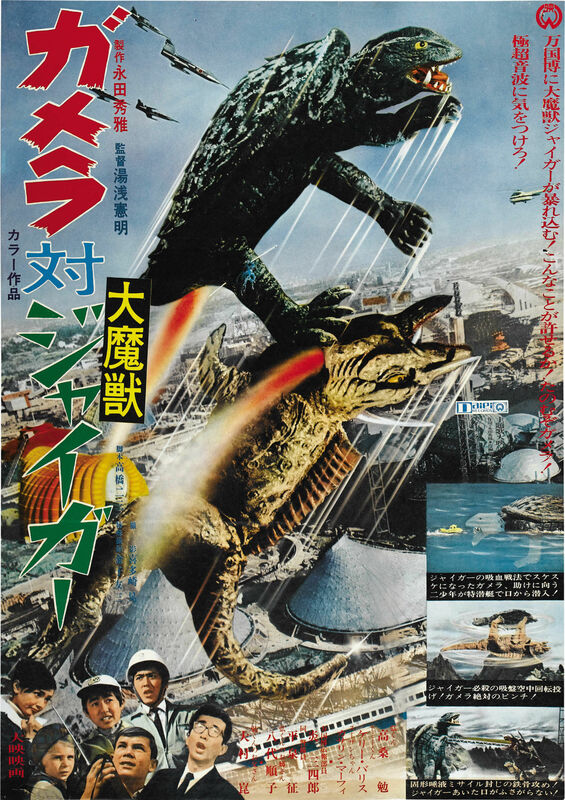 Gamera vs Jiger (1970) – SKREEONK! Monster X, eh? That title gets tossed around a lot! Orignally released as ガメラ対大魔獣ジャイガー Gamera Tai Daimajū Jaiga, Gamera versus Giant Demon Beast Jiger, the US version saw the title of Gamera vs Monster X. The story starts out with an expedition to Wester Island, home of the mysterious statue, “The Devil’s Whistle”. The plans are to bring the statue back to Japan and use it at the 1970 World Expo to help explain myth and culture in human history. An angry African envoy preaches of a deadly curse that will come about if the statue is removed, making a reference to “Jiger.” Of course, the excavation continues, and the statue is loaded on to a ship. During the loading process, Gamera arrives and tries to prevent them from moving the statue. After being shot at, he ceases his advance, and at the sight of a nearby volcanic eruption, he disappears. As the loading process nears completion, they hear a strange noise from the statue, but can’t pinpoint what it is. 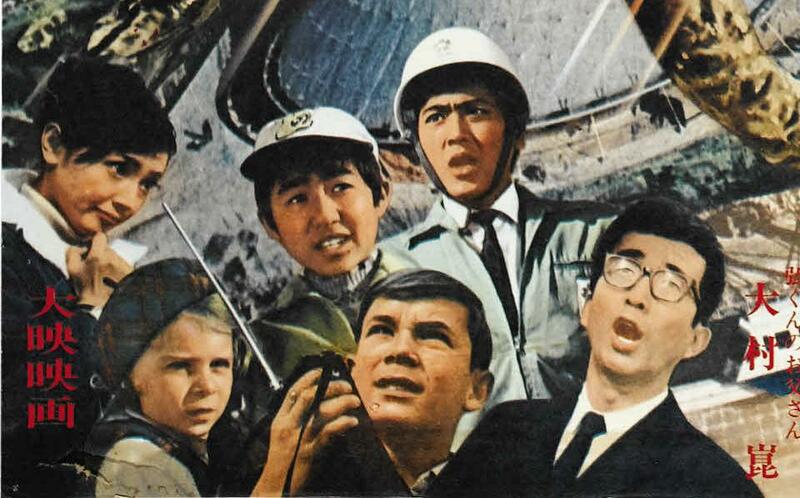 When the ship arrives in Japan with the cargo, all of the crew members have come down with an unexplainable illness. Back on Wester Island, from the earth beneath where the statue stood, Jiger emerges. After making a stop at the water hole, she hears Gamera, and the turtle flies down to meet her, and a brief battle ensues, leaving Gamera stranded by Jiger’s sharp, barb-like projectiles fired from her horns, and Jiger heads for Japan. Upon arriving, she proceeds to make her way to the Expo site, and she grabs the Devil’s whistle and throws it into the ocean. Gamera then arrives and another battle ensues. During the battle, Jiger pulls Gamera close with the suction cups in her feet and stabs Gamera in the shoulder. Gamera staggers in pain toward the shore losing color, and then passes out halfway into the water. Eventually, the military runs out of options, and at the request of two young boys, they take X-ray pictures of Gamera, in hopes they might figure out what is wrong with him and revive him. They discover a huge dark spot in his lung, and the two boys take it upon themselves to enter Gamera’s body. Upon doing so, they encounter a small version of Jiger; the adult had laid an egg, and the baby was draining Gamera of his blood. They kill the baby with radio waves from a broken transmitter, and then exit Gamera’s body to tell the authorities who immediately put the new plan into action. Gamera is revived by large amounts of electricity to his heart, another request from the boys. 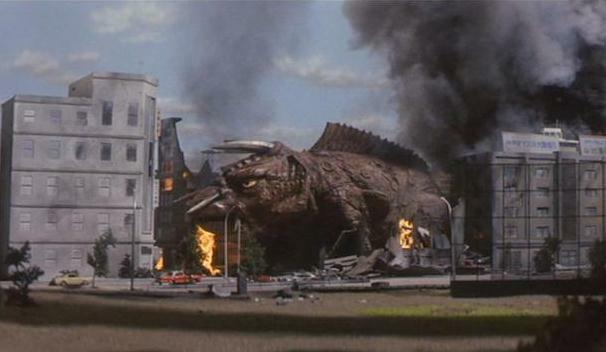 After the radio wave plan fails, Gamera arrives and does battle with Jiger for the final time, recovering the sunken statue and driving it directly through the creature’s skull. Look out folks; it’s another wacky adventure in Gameraland! This installment in the Show Gamera series pits the giant chelonian against another unique monster, Jiger, a four-legged, Ceratopsian-esque monster. Jiger, unlike the two previous monsters, is an earth-bound monster. Jiger has the ability to shoot projectile barbs from her horns (a process that is accompanied by an extremely funny noise and looks kind of like sneezing), emits a strange sonic beam from a globe between her eyes that can melt flesh, and has feet that are also very powerful suction cups. Another ability of Jiger’s is her rocket boosters, which allow her to move very quickly through water, and can allow her to jump higher and over great distances. The spike in the tip of her tail is actually a hypodermic needle, through which she injects her eggs. She proved herself a formidable opponent for Gamera. The storyline in this film is somewhat enjoyable with relatively interesting characters. The plot doesn’t center heavily on the children, though they are a large part of the story. Also, this time out, the children aren’t mind-numbingly annoying and actually do good jobs with their roles. The adults are the normal stereotype for these movies; pretty dense and oblivious to the children’s ideas for the most part. Then all of a sudden, they come up with a plan that saves the day, which goes to show you how child-oriented these films are. The monster battles are relatively enjoyable, but this time the special effects department is really getting sloppy. Jiger is a generally ugly, dumb-looking monster (bad guys can look cool, too y’know), and her abilities are laughable. The “sneezing” of the barbs from her two front horns, which is what it sounds like, is laughable, as is her orange ray from her forehead, dubbed the “Super Ultra Ray” (creative, isn’t it? ), and her rocket boosters. The most eye-rolling ability for me was her suction-cup feet, which she used to pick up a rock and also subdue Gamera during their second encounter. Back to the sloppy special effects: this movie, in my humble opinion, has some of the worst effects in the series. Jiger’s ability to boost into the air, her swimming scene, and several other shots of that nature were achieved through the use of a very stiff model; and the most noticeable part was the incredibly stiff tail. As Jiger is chasing Gamera across the island, the shots of her jumping through the air are painfully obvious that it is the model. The worst shot, however, is toward the end of the second encounter: As Gamera gains the upper hand; he grabs Jiger by the tail and lifts her into the air, slamming her down. The tail remains stiff as a board, and looks more like a plastic model instead of a small prop. As she hits the ground, her tail hits first and it is a gruesome sight, as the tail simply bounces off of the ground. The “super ultra ray”, the name given to her beam weapon, is achieved by cartoonish animation as she cooks a city block. On the other hand, as the shots of her ray began raining down on the soldiers; their bodies gradually turning to skeletons, is rather impressive, but still cheap. The suits themselves are handled well though. Gamera’s suit goes without saying, since it’s been the same since the beginning. Jiger’s suit, despite being ugly as sin, was used well. 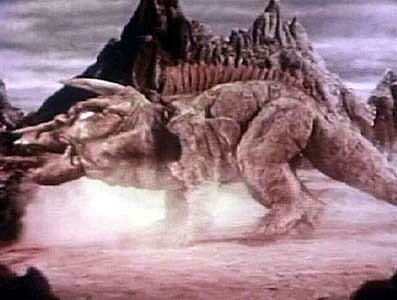 She was a four-legged monster, and most of the four-legged monsters I have seen out there, Anguirus, Baragon, Guiron, and the like; the technique used to portray them was to simply have the suit actor crawl around on their hands and knees, which can be somewhat of an eyesore. Jiger, however, did not; the actor actually walked on all fours inside the suit. Enough of the special effects for now. Weird science rears its ugly head once again here, as is the norm for the Gamera films. It’s not as bad as in recent films, but it does show up. After Gamera gets “stung”, the military takes X-ray pictures of him from helicopters, highlighted with a cartoonish red ray. After determining he has a parasite inside him (after watching an insanely disgusting video of an elephant with a similar problem) they trie to figure out what to do. The two main characters decide to borrow a mini-sub and go into Gamera’s body. Entering through his mouth, they navigate until they come to dry “land” and get out to begin their diagnosis. Gamera’s insides look like a cave. Now, I have taken anatomy; and though I don’t know a turtle’s anatomy, it’s hard to believe that. After finding a baby Jiger crawling around inside of him, and after getting sneezed on (not kidding; the baby blows a sticky white substance from his nose. ), they finally kill him by attaching a malfunctioning radio to his head, which he cannot stand the sound of. After they kill him, they decide the only way to revive Gamera is to shock his heart with a large amount of electricity. Somehow, they travel to his heart and set the power cables. Long story short, it is laughable at best. Still, this is one of the more enjoyable entries for me, because despite the weird stuff, it seemed like an interesting story. This movie gets three stars out of five from me. For you? Well, you’ll just have to experience it for yourself! Posted on September 5, 2011 0 By Jon D. B.	Daiei Movie Reviews! Posted in Daiei Movie Reviews!, Kaiju Movie Reviews!